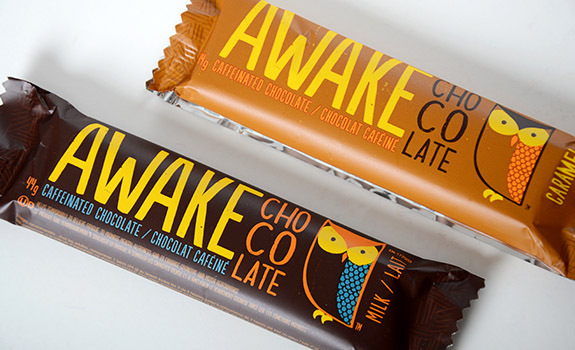 The two available flavours of Awake caffeinated chocolate bars. Take your pick of milk chocolate or caramel. It’s nice to have a choice. Finally, at long last, a chocolate bar for the student cram session. 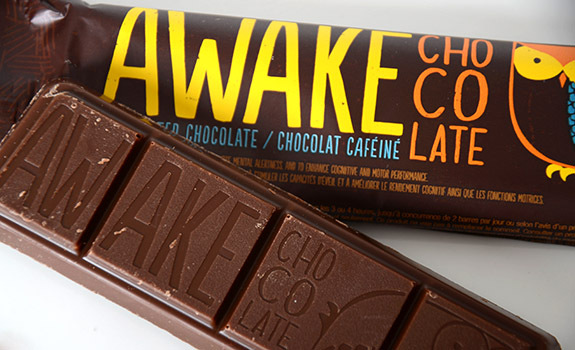 Not only can you satisfy your snack-craving with an Awake chocolate bar, but you can also get a caffeine jolt equivalent to drinking about 3 cans (355 mL each) of Coke, thus saving valuable time (and washroom breaks). Or so I’d imagine. It’s also probably a great treat for freelance writers and programmers working to deadline until 6 a.m., and maybe even shift workers with a sweet tooth. Also awesome for a road-trip caffeine boost without adding any coffee-related pit-stops. It’s important to note that the caffeine content is 101 mg per 44 g bar. By comparison, the numbers on the Starbucks website peg a grande (16 oz) drip coffee’s caffeine content at 330 mg, so while you’re getting more than you’d find in a can of typical cola, you’re still not in the caffeine big leagues. As much as the caffeine content is the selling point, it’s a chocolate bar, so you’d better hope it tastes good. The Directions (printed on the package), which reads like it came from the side of a bottle of Tylenol: “Adults take 1 bar (44g) as needed every 3-4 hours, up to 2 bars daily, or as directed by a health care practitioner. If security seal is missing or broken, do not use. For occasional use only. This product is not intended as a substitute for sleep.” And it continues, with warnings about blood pressure, interactions with medications, breastfeeding, etc. A tad alarming, this. The Look: Pretty. The packaging stands out on the rack, with a cool owl illustration and a great colour palette of brown, yellow, orange and blue. The bar, stamped with the Awake name and logo, is scored into four pieces for easy portioning. If you only need a light energy boost, one piece may be all you need. The Taste (Milk Chocolate): Nice chocolate intensity that melts easily on the tongue. The chocolate quality isn’t spectacular, but it’s also perfectly adequate. It’s a step above eating a handful of chocolate chips. As it melts, it’s a bit grainy/sandy on the teeth. Good level of sweetness. The Taste (Caramel): Like the regular milk chocolate bar, but with a caramel filling. I found it a bit too sweet, but it might be a nice change if you’re looking for something more than plain chocolate. Big plus: my bar wasn’t messy to eat, as the caramel was well contained within the scored sections of the bar, unlike the mess that usually results when eating a Caramilk. A milk chocolate Awake caffeinated chocolate bar. Note the nicely scored sections, which makes the bar easy to share or ration. Cost: $2.50ish for a 44-gram bar looks to be the going rate, be it at a drug store or convenience store. Value for cash money: Compared to a similar-sized Dairy Milk? Not great. Compared to a coffee? Better. Compared to a premium chocolate bar? Better still. Availability: Was very widespread a few months back, but has recently become harder to find. It’s made by Mississauga-based Awake Corporation, so I’m not sure if it’s widely available in the U.S. yet. (Would an American reader care to leave a comment about availability in the States?) During a recent road trip to B.C., these bars were everywhere. London Drugs, gas stations, etc. Nutrition? : Per milk chocolate bar (44 grams): 230 calories, 12 grams of fat, 35 mg of sodium, 1 gram of fibre, 2 grams of protein. NOTE ABOUT CAFFEINE: This is super important, so pay attention. Health Canada recommends that healthy adults consume no more than 400 mg of caffeine a day, and there are many situations where you’d want to consume much less than that. Please pay attention to your total caffeine consumption so you don’t go over the limit. The verdict: An effective and reasonably yummy way to stay alert when you need to. Just note that caffeine has side effects, so be careful. It’s much better value if you buy the Awake chocolates in the larger bags. True, the chocolates are individually wrapped, which pings my guilt factor (hello landfill! ), but it’s still cheaper – and more easily shared. To answer your question about availability in the states (4 years later…) I know you can at least find these in Michigan, but it’s pretty limited. I have only been able to find them in two cities so far (Kalamazoo and Grand Ledge), and I have only seen them at Meijer and on my college campus. They are delicious though!! I would love to see them in more stores.